Sometimes when we give to an offering, we don’t know where the money goes. In honor of Mother’s Day, on May 13, here are two articles about women being helped by your World Hunger Fund offerings, one in Kenya, and one in Tanzania. We hope you enjoy these stories. Evelyne first connected with the Kenya Evangelical Lutheran Church (KELC) women’s work through a seminar in her congregation in Naserian Mission. Here she learned about girls’ rights, the importance of education, and support networks available to women and girls in Kenya. Just a few weeks later, Evelyne needed to access those support networks when her father informed her that he had arranged for her to marry an older man in their community. Evelyne was only 14 years old. She wanted to continue her education, and she did not want to be married. Evelyne called many people looking for help to escape this situation, but at first found no one to assist her. Eventually she contacted Alice Mwaringa, the KELC Women’s Department coordinator. Alice quickly found a way to remove Evelyne from her home and take her to a safe place. With help from many people within the KELC women’s network, Evelyne was welcomed into the home of a family near Mombasa and enrolled in a nearby secondary school. a blessing from her father. Now in her last year of school, Evelyne has been selected as Head Girl and her teachers praise her for her hard work and good scores. Evelyne is hoping to continue her education by going to university to study accounting. Evelyne has also been welcomed back into her family home, where she had been barred from returning, after refusing her arranged marriage. Over several years, and with intervention and counseling from KELC leaders and community elders, Evelyne’s father has accepted her decision to pursue education instead of marriage. At the end of last year, Evelyne’s father invited her home, where he gave her a blessing for her future and success in her schooling. We thank God for Evelyne’s strength and achievements and we pray for equity and justice for all girls in Kenya and around the world. 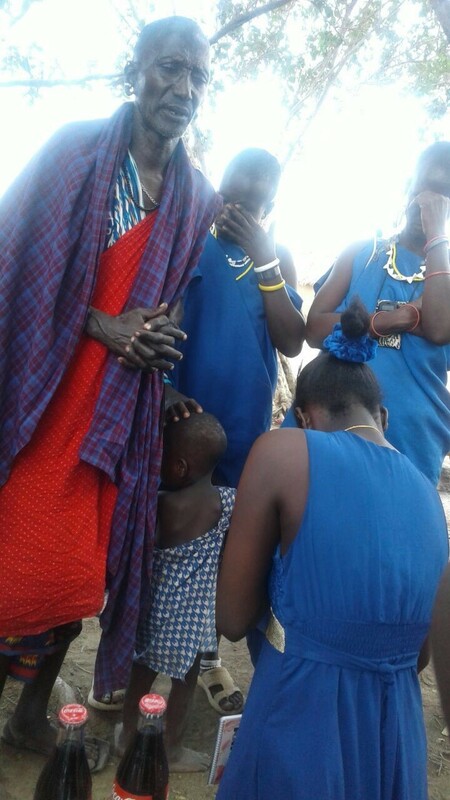 Thanks to Elizabeth Hendrickson, ELCA missionary in Kenya, for this story and photos. The work of the KELC Women’s Department is funded mainly by ELCA World Hunger funds. Jane Mwalyego, the widowed mother of four, lost her husband to HIV/AIDS in 2002. Jane was diagnosed with HIV just before her husband’s death. At that time, due to the stigma attached to HIV/AIDS, her husband’s family disowned her and her children. Bereaved and heartbroken, Jane and her children had to travel1500 kilometers (almost 1000 miles) from Musoma, her husband’s home village, to Mbeya where she settled at her brother’s home. There her health quickly deteriorated and she became bedridden. In 2005, a Palliative Care team from the Evangelical Lutheran Church of Tanzania (ELCT) learned of her case and began to visit her regularly. They nursed her bed sores, managed her pain holistically, and provided counseling. In 2008 she moved to Arusha, in northern Tanzania, where she began Antiretroviral Therapy. Sadly, her eldest, a teen-age son, died of HIV/AIDS around this time. In Arusha, she continued to receive Palliative Care services, including bereavement counseling and psychosocial support, from Selian Lutheran Hospice. By 2015, she had recovered her strength and was invited to attend training for home-based care volunteers so that she could help other patients in her situation to face life again. Although Jane has only a primary school education, she became one of the best peer counselors in the region for patients and families affected with HIV/AIDS. The ELCT Palliative Care Program also introduced Jane to Village Community Banks, which provide micro-loans for income generating activities. With a small loan, Jane started to do small scale farming for vegetables and other nutritional crops. Today she has a small business selling a variety of healthy nutritional products from which she earns a good income. 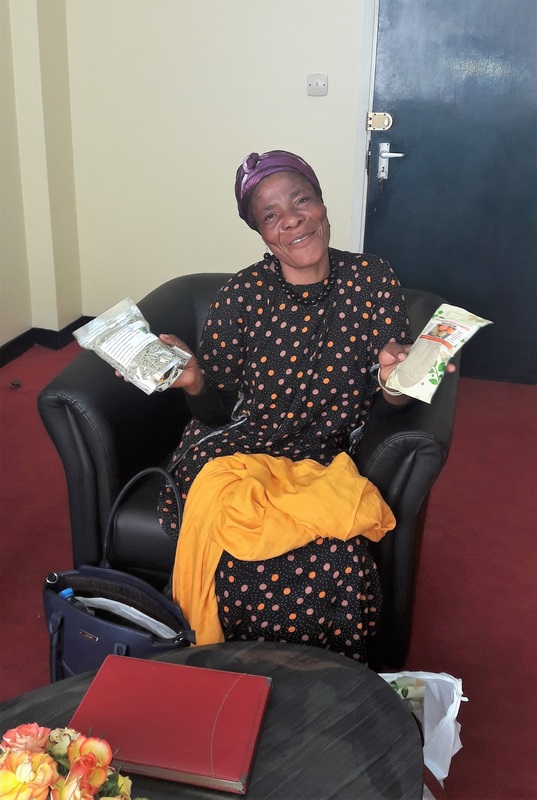 She has been able to pay school fees for her children; one of them recently graduated as a teacher while her youngest is completing her university degree at Dar es Salaam University. In September 2017 Jane had the privilege of testifying before members of the Tanzanian Parliament to advocate for the availability of better Palliative Care services throughout Tanzania. Thanks to Dr. Paul Mmbando, head of the ELCT Palliative Care Program, for this story and photo. The ELCT Health Department’s Palliative Care Project is funded by World Hunger grants.